MacLean-Blevins & Associates has developed several unique product concepts relating to safe fluid dispensing. More specifically, concepts relating to fluid dilution and dispensing utilizing a pressurized fluid stream, such as water from a typical garden hose. 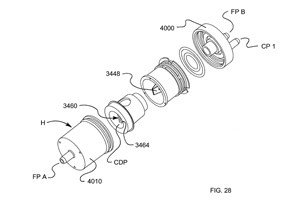 These concepts build upon the experience derived through designing several hose-end sprayer devices for multiple end use applications over the course of the last two decades. These unique product concepts are the subject of several U.S. patents which are available for license and development into final form products. Safe Hose-End Apparatus - Dilution and dispensing of a concentrated fluid with a hose-end device which is pressure responsive. 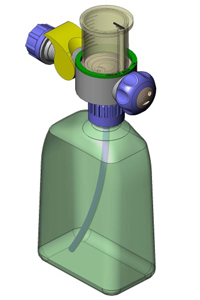 This concept covers a hose-end dispenser which includes a pressure responsive valve feature, such that the valve will not function without suitable water pressure from the connected garden hose. The product is used on any standard container or bottle with a 28mm or 38mm neck and is installed just as any regular hose-end or trigger apparatus would be – dip tube into the neck and torque the swivel cap to a preset value on the filling line. The innovation in this concept is the need for line pressure to open the valve. This means that after filling/capping is complete the container is essentially sealed until a hose is connected and water pressure is supplied. This protects the contents of the container from unwanted escape through the dispensing apparatus or through its venting system during storage, shipping and handling; including during retail shelf display and transportation to the point of use by the end-user after purchase. Perhaps the largest benefit comes once the end-user has the product at the point of use and has used a portion of the concentrated material within the container – once the garden hose is depressurized and removed, the pressure responsive valve resets and the container is once again closed and sealed. For example, Joe Homeowner uses a highly concentrated pesticide around the foundation of his home to prevent ants or other insects from entering the home. Let’s say he uses half of the concentrated pesticide and then removes the product from his hose and stores it in the family garage or garden shed. With current dispenser technology the container and hose-end dispenser should contain the concentrated pesticide, provided that Joe Homeowner has manually put the valve mechanisms on the dispenser into the proper closed positions. If Joe does not, then there is a possibility for the concentrated pesticide to escape the container; or, should someone else decide to explore the container and device they saw Dad using and actuate the valve to an open condition a similar possibility for the concentrated pesticide to escape will exist. With the pressure responsive technology within the hose-end dispensing apparatus described in this concept, the possibility of the concentrated chemical contents escaping is limited to when the hose is attached and the water pressure is applied. In most every instance when a hose-end dispenser of this nature is used the first operation the user performs when finished applying the concentrated chemical is to turn off the water pressure. This is a natural and intuitive operation done to prevent further loss of water and to begin the process of clean-up and storage of the garden hose. Once the garden hose is depressurized the hose-end dispenser apparatus will reclose and seal the container – ready for the next use. While this technology represents a milestone in safe packaging for consumer use it also further protects the retailer and producer. Many of these pre-filled bottles with hose-end dispenser sit directly on shelving for retail display and sale. Say for example our Joe Homeowner is trying to evaluate which product to purchase of the multitude of choices on the shelf at his local hardware store. He picks one up reads the instructions, decides that this one should be the solution to his weed problem at home, then decides to try the knob to see how easy it is to use – it’s a bit loose feeling – so, he tries several more and found one that he thinks is adequate, puts it in his cart and continues shopping. Unfortunately one or more of the ones he “tried” were left in a partially open condition. Over the next few hours, some shopper bumped into the shelf while trying to pass another shopper and several bottles were knocked on their sides. Later that day while trying to pick out the correct size gardening gloves, Mary notices her two-year old daughter finger painting in some brownish fluid on the floor at the end of the aisle and notices that there is brown stain on her dress and mouth. These examples are perhaps not your everyday occurrences and users are typically careful with these types of products, however, the risk is real and, more importantly, the ability to prevent the risk can be obtained with the use of the technology presented in this concept. U.S Patent 7,566,013 covers this concept and is available for licensing. A second application on this concept, Pub. No. US2009/0250527 is in examination at the USPTO at this time. A third application on this concept, Pub. No. 2009/0261122 is in examination at the USPTO at this time. Safe Hose-End Systems - Dilution and dispensing of a concentrated fluid with a hose-end device which is pressure responsive. 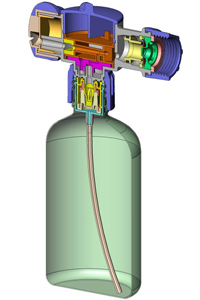 This concept covers a hose-end dispenser and bottle system which includes a pressure responsive valve feature, such that the valve will not function without suitable water pressure from the connected garden hose. 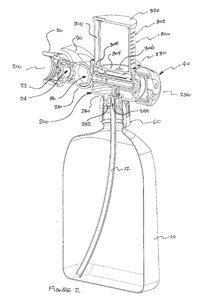 Given the same potential risk and the need for a method to reduce the risk, this concept combines the hose-end dispenser and bottle as a system; and, positions the pressure responsive valve feature into the neck of the bottle. With this enhancement the concentrated contents within the bottle are now fully protected even if someone were to remove the hose-end dispenser from the bottle. The pressure responsive valve assembly is used on a container or bottle with a custom 28mm or 38mm neck designed to accommodate and seal to the pressure responsive valve. It is installed on the filling line much like a hose-end or trigger device might be – dip tube into the neck and then a downward press force fit to the I.D. of the neck. The innovation in this concept requires the presence of pressurized fluid to open the pressure responsive valve within the container neck. This pressurized fluid is passed to the pressure responsive valve through the hose-end dispenser device which must be in place in order to supply the fluid pressure to the correct port for operation. With the hose-end dispenser device removed the pressure responsive valve cannot be operated either with fluid pressure or manually with some tool. The only means to remove the contents of the container without the hose-end dispenser device and pressurized fluid is to cut the container open with a sharp knife or tool. One possible advantage to this “system” concept is that the hose-end dispenser device can now become more of a durable device and might be useful as a dispenser for multiple containers of various chemical concentrates. Additionally, this system might be integrated into portable water systems such as tank spraying systems, either handheld or backpack style tank sprayers. Allowing the tanks to carry clear water and the chemistry to all be diluted and delivered at the dispensing end – minimizing clean-up and chemical exposure or cross-contamination exposure to the user. U.S Patent 7,753,288 covers this concept and is available for licensing. Hose-End Dosing Apparatus - Dilution and dispensing of a concentrated fluid with a hose-end device for easy and correct dosing. 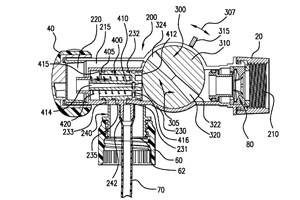 This concept covers a hose-end dispenser which includes a portion control chamber that is used by the operator to correctly meter the total volume of concentrated fluid applied to a given area, independent of the dilution ratio. The product is used on any standard container or bottle with a 28mm or 38mm neck and is installed just as any regular hose-end or trigger apparatus would be – dip tube into the neck and torque the swivel cap to a preset value on the filling line. The innovation in this concept is the provision of a metering volume and a quick and easy means to fill and evacuate the metering volume. Many useful chemical products have been developed to aid the homeowner in the care and upkeep of their property and yard. These include plant foods, weed prevention mixtures, pest prevention solutions and many others. The problem that exists is one of proper application of these chemical products. Several of these chemicals are presented in liquid form and are to be applied at some given rate per area of surface to be treated. This is easy to understand academically, however when faced with the reality of standing in your yard with a bottle of concentrate that reads – apply at a rate of 1 fluid ounce to 100 square feet, what do you do? Well you buy the hose-end sprayer that says apply at a rate of 1 ounce per 100 square feet and you look at the hard to read markings on the bottle and spray till it looks as if you have delivered enough. Another method is to dilute it using a garden sprayer – now you need to calculate, given a ratio indication on the sprayer, just how many gallons of total liquid you need to deliver, then guess how many gallons a minute you hose delivers to figure out how long to spray a predetermined area. Given these methods it is extremely common to over apply the chemical – that is to apply far more than is required; leading to runoff pollution of streams and groundwater. 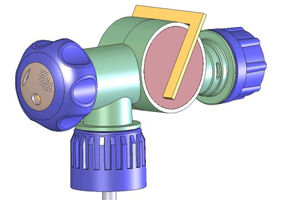 The hose-end device of the current concept incorporates a top mounted visible sight glass style metering volume container along with a valve means to allow the user to fill the metering volume container and to dispense from the metering volume container. The chemical product would be concentrated to a ratio that would match the metering volume portion – for example if the metering volume was a 2 ounce volume then the instructions would read – fill the metering volume and apply this volume to 100 square feet of surface. The user would use the hose-end sprayer to fill the metering volume container, turn the valve to the dispense setting and then dilute and dispense the fluid from the metering volume onto the estimated surface area indicated until the metering volume container was fully evacuated and empty. The user has now applied the correct volume of the chemical to the correct surface area – no more and no less – totally independent of the volume of water used to do the job – no calculations or guessing required. When finished, the user would then set the hose-end device valve to the clean setting and fill and dispense clear water from the metering volume container to rinse away any residual chemical. It must be understood that this method of delivery can be used accurately for delivering a certain chemical dose to a predetermined area of surface. However, it does not produce or deliver a precise ratio of the concentrated liquid to the carrier stream of water. Some cleaning products and disinfectants are indeed sold in concentrated forms but these do require precise dilution in order to be effective. Hence, this metering method should not be used for chemical systems requiring precise dilution. U.S Patent 7,661,604 covers this concept and is available for licensing. Hydraulically Controlled Valve – Valve apparatus controlled by pressure responsive valve for in-line control of fluid flow for wall eductors and dilution systems. This concept covers an in-line valve that can be used to control the flow of a liquid based upon the presence of pressure from a second fluid. For example in wall mounted educator systems water is used to dilute a concentrated chemical as it is being delivered into a container or bucket for final use. The hydraulically controlled valve would prevent the flow of the concentrated chemical unless suitable water pressure for the diluting flow was available – thereby containing and preventing unwanted flow of the concentrated chemical fluid. The hydraulically controlled valve assembly can be retrofitted into a bottle closure to fit to a 28mm or 38mm neck to mount directly to the concentrated chemical source container. Alternatively, it can be a freestanding appara tus that can be mounted at or near the educator system, or it can be designed into and as part of the educator molding itself. 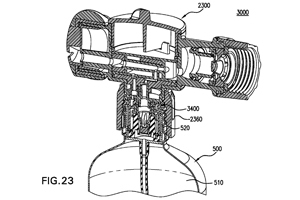 A variation on the device would allow a single hydraulic input (water pressure) control two pressure responsive valves simultaneously – this would allow a single water source control two different fluids simultaneously. These could be diluting and filling two different final containers or it could be diluting (at two different ratios) and mixing the two chemicals into one final container. 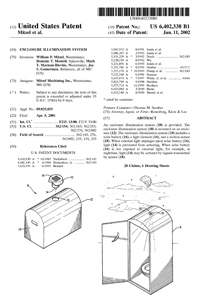 U.S Patent 7,866,626 covers this concept and is available for licensing. Illumination for Remote Enclosures – Illumination inside of a garden shed, outhouse, boat cabin, cooler, or mailbox; battery powered with solar recharging and a non-contact timed switch. This concept covers a series of possible products that would provide a moderate illumination source that needed no wiring and could function for some time without maintenance. The illumination is provided by an array of LED’s powered by internal rechargeable batteries which are charged by a built in photovoltaic panel. The illumination is switched by means of a passive infrared (PIR) sensor that is powered only when the ambient light available it not sufficient – in other words, when it is dark outside, and once triggered, the illumination remains powered for a preset time after the sensor is dormant. One possible example is an ordinary street-side household mailbox. The unit is mounted on the top surface of the mailbox with the LED dome sticking through a small hole drilled by the user. 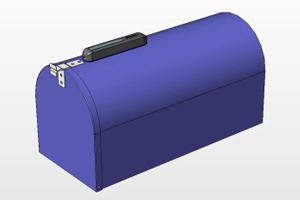 The unit comes fully assembled with a self-adhesive gasket that mounts the unit and seals the mailbox from unwanted moisture ingress. If it is dark outside and when the mailbox door is opened the PIR sensor activates the unit and the interior of the mailbox is illuminated. The user can see if there is mail in the box or if there is some big harry spider in there just waiting for the users hand to enter. Once the door is closed, the sensor becomes dormant the timer counts down and the LED is turned off – thereby preserving battery power and life. 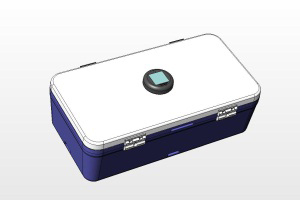 Another good example is a cooler – mounted in the lid of an ordinary cooler the unit would, given that it is dark outside, turn on and illuminate the interior of the cooler when the lid was opened and the PIR sensor was activated. Once the lid was closed the PIR would become dormant and the LED would be turned off preserving battery power and life. If the lid were left open the LED would remain lit as long as someone were in range of the PIR sensor – say 1 to 3 feet from the lid – once there was no change in heat signature in the PIR range, the PIR would go dormant and the LED would time out and turn off until the PIR was triggered again. Another good application is use within a portable toilet or outhouse. The unit would mount in the roof – same as with the mailbox application drill a small hole then peel and stick the unit to the outhouse roof. The unit charges all day and does not function till the ambient light is insufficient to see (it is dark outside) the person using the outhouse opens the door, the PIR sees activity, and turns on the LED array. The LED array stays lit until the outhouse is unoccupied then the unit times out and turns off. 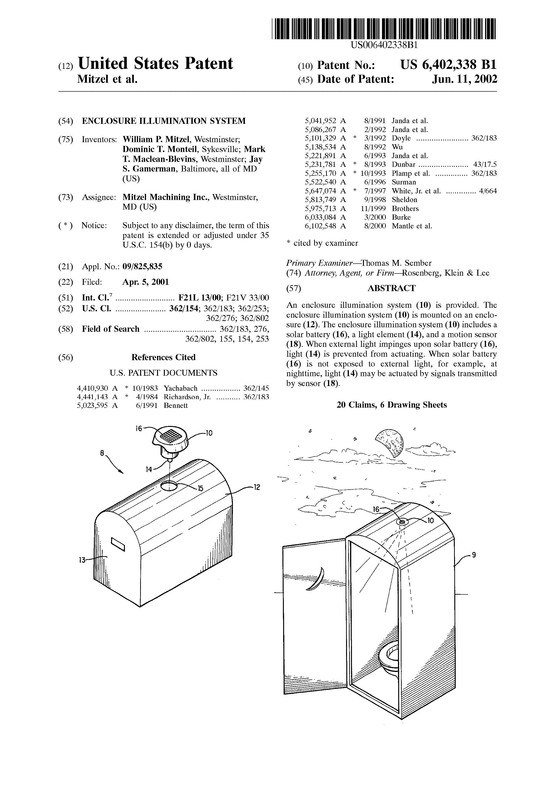 The PIR focal range will be tuned for this application to catch a person standing or sitting – even a child – so that the illumination will continue until the outhouse is vacated. In all of these applications you will note that the unit is mounted outside of the enclosure and there is no action required by the user to initiate or conclude the use of the illumination. This makes it an ideal accessory for outdoor sheds or for areas where flammable liquids might be stored – illumination with no need for electricity and possible arcs or sparks. U.S Patent 6,402,338 covers this concept and is available for licensing.